Editor’s Note: This is an updated version of a similar article published in March of 2015. To view the original, click here. 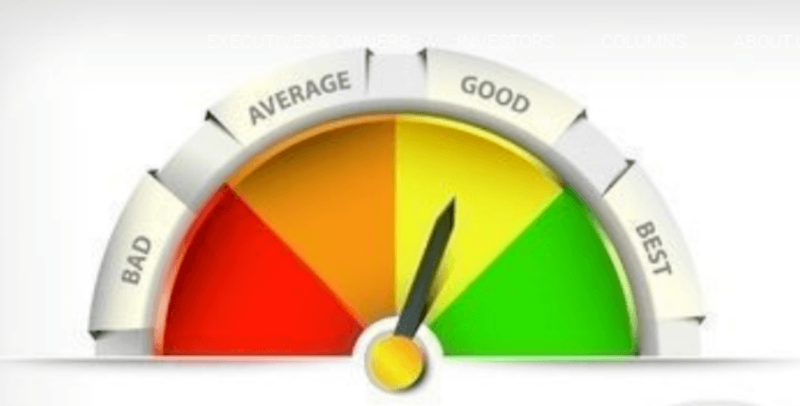 How do you monitor your investments’ performance? If the company is doing well, does that mean your investment is doing well? When it comes to cash flow vs. EBITDA (Earnings Before Interest, Taxes Depreciation and Amortization), which is the better performance measure? Return on investment (“ROI”) is the sum of any cash payments received plus any appreciation in the market price (today’s selling price, less purchase cost), divided by your cost. For example, if I bought at $50/share on January 1, 2017, received $1.50/share in dividends during 2017 and sold at $54/share one year later, my return of $5.50 equates to an 11.0% ROI. That same principle of ROI can be used to measure the performance of a company. Just take the market capitalization of the company (the aggregate market value of the equity) at the beginning and end of the holding period and any cash distributions during the holding period. This is the conceptual basis for Total Shareholder Value (“TSR”), the currently popular metric to measure company performance for executive compensation schemes, and relative TSR, a comparison of TSR to a peer group of companies. However, there are other metrics that are often considered when evaluating company performance, including several different measures of earnings. Some are based on generally accepted accounting principles (GAAP) such as net income (NI) and earnings per share (EPS). Some are considered “non-GAAP measures” because their calculation is not defined by GAAP. EBITDA is a non-GAAP measure often considered in pricing a transaction in the acquisition market. It is commonly used for “earn-out” clauses in purchase agreements. For example, the pricing of a transaction might be a multiple of EBITDA and, in its simplest form, an earn-out might be structured as an additional payout to the sellers if EBITDA exceeds a certain threshold during a specified subsequent period. Cash flow via the TSR and rTSR metrics is the most popular measure of company performance for executive compensation schemes among public companies. EBITDA is the most popular measure of company performance for compensation to sellers in private acquisitions. So, when it comes to cash flow vs. EBITDA, is one better than the other? If the ROI or TSR of an investment exceeds an appropriate comparative benchmark, does that mean that management performed well? 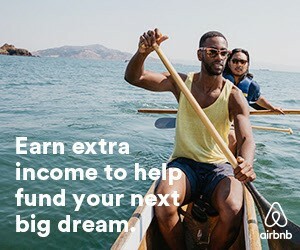 Does it mean that the value of the company has increased? So, how does the performance of the company relate to the performance of your investment? To answer that question, let’s first clarify the difference between the investment and the company. Investors provide capital expecting a return. The investment can be structured as debt, equity or a hybrid. The company’s invested capital (IC), includes capital raised from equity investors and borrowing. The value of the IC is equivalent to the cumulative asset values, minus operating liabilities (e.g. accounts payable and accrued expenses). The value of the equity is the value of the IC, minus the borrowed capital. When actual returns are greater than investor required returns, the IC increases in value. As the business generates returns on invested capital (ROIC), they accrue to both lenders and shareholders. Lenders have a priority claim on the returns. The residual, in excess of the contractual amount, accrues to the equity shareholders. As the business generates returns on invested capital (ROIC), they accrue to both lenders and shareholders. The proportion of borrowed capital to total capital is referred to as financial leverage because the returns are being levered higher to the shareholders by a fixed lower return to the lenders. The ROIC may be different than the cash returns to the shareholders, depending on whether financial leverage is being employed. The returns are also allocated to the different types of capital, which may be complex. This often includes multiple types of debt and classes of equity, each with its own rights and preferences. Thus, the performance of your investment depends on how your investment is structured and is not necessarily the same as the performance of the company. When considering cash flow vs. EBITDA, it’s useful to know if and where they are reported. Earnings are reported on the income statement, while cash flow is reported on the aptly named statement of cash flow. EBITDA is not necessarily reported anywhere! It is an accrual-based measure that will only be reported voluntarily. Accrual accounting matches cost with revenue regardless of when cash is received or paid, while cash flow is a measure of cash disbursements and receipts without concern for matching costs and revenue. EBITDA is a measure intended to provide a sense of ongoing operating earnings. It excludes certain impacts related to discretionary decisions by the owners on tax structure, financial leverage or capital intensity. EBITDA is most popular in the acquisition market where the acquirer has the ability to control those discretionary decisions. Cash flow is not an accrual-based measure and is subject to the timing variances of disbursements and receipts. Cash flow before payments of interest expense and principal is considered the unlevered cash flow. 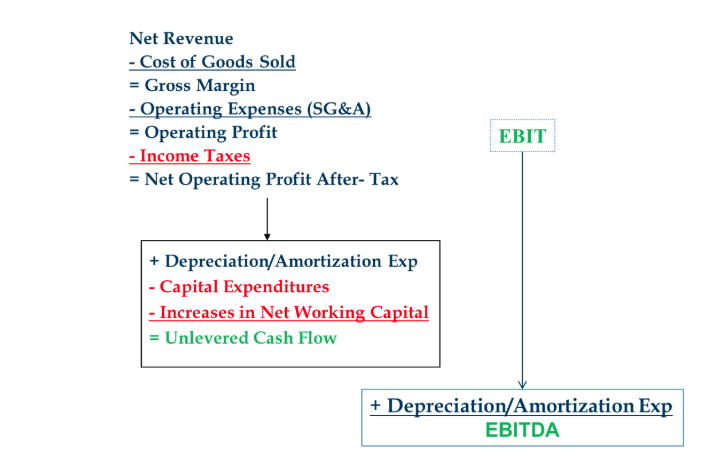 The unlevered cash flow includes the payment of taxes and the replenishment of capital, but similar to EBITDA, does not consider financial leverage. Many investors focus on EBITDA in the acquisitions market. In this case, the investor is acquiring a controlling interest in the company and also controls the degree of leverage. EBITDA is also a popular metric for earnouts, or mechanisms embedded in purchase agreements to provide the sellers of a company with performance-based consideration. The consideration is often contingent on EBITDA exceeding a given threshold. EBITDA is popular because it excludes items that can distort performance, or be manipulated, and reflects the company’s sustainable operating earnings. However, it does not provide any indication of performance at the investment level, only at the company level. Should a company focus its efforts on increasing EBITDA or cash flow? Which more closely tracks value? To increase the value of the company, it is necessary to earn a cash return greater than the cost of capital. For each dollar of cash reinvested, the company must earn its cost of capital (or greater) to increase value. There is no such benchmark of value creation for EBITDA. It can only be used to measure value if we assume a constant valuation multiple. To increase the value of the company, it is necessary to earn a cash return greater than the cost of capital. Cash flow vs. EBITDA, which is better? There are several measures of financial performance that are useful in understanding the ability of a company to generate value for its investors. EBITDA compares the performance of one company to another, but only sustainable cash flow relative to the amount invested is a true measure of financial performance. When paired with the correct benchmark (the cost of capital) it becomes clear whether the company is creating value or not.